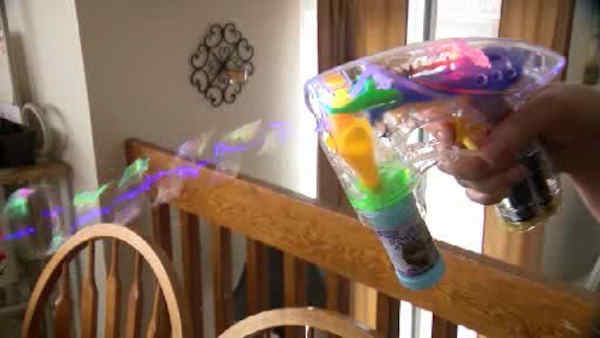 COLORADO (WABC) -- A 5-year-old Colorado girl was suspended after authorities say she brought a clear plastic bubble gun to school. The district is defending a decision critics say defies common sense, after the girl who loves bubbles brought her princess bubble gun in her princess backpack and was immediately suspended for the day. "They said it was a fake weapon, and that I needed to come get her," said the girl's mother, who didn't want to be identified. "I appreciate that they're trying to keep our kids safe, I really do. But there needs to be some common sense." A spokesman for School District 27J in Brighton declined requests for interviews, but in an email defended the suspension, stating it "is consistent with our district policy." Nathan Woodliff-Stanley, executive director of the ACLU of Colorado, said these kinds of out-of-proportion punishments have become a national embarrassment, with suspensions for pastry guns, Hello Kitty guns even a finger pointed like a gun. Post-Columbine, schools nationwide enacted zero-tolerance policies, but Tom Mauser, whose son was killed at Columbine and who is an advocate for stricter gun control, said that because of cases like this, he now opposes zero-tolerance. "We're given a brain, and we should use it," he said. The district states other students at Southeast have had one-day suspensions for bringing items such as Nerf guns, stating, "students can not only create a potential safety concern, but also cause a distraction." Still, the mother of this student is questioning the punishment, though she agrees the toy should have been taken away. "I explained to her, 'hey you messed up not asking mommy if you could bring that to school,'" she said. "'You know to ask.'"